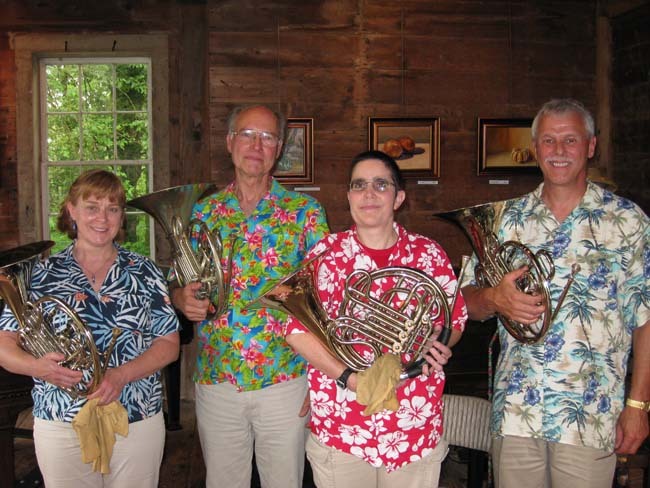 Bill Karstens, Bruce McRae, Helen Read, and Marti Walker are the Vermont Horns, a horn quartet based in northwest Vermont. The four of us have known one another since the 1980s, when Bruce, Marti, and Helen all parctipated in Bill's horn ensemble at the University of Vermont. After Bill left UVM in the mid-1980s, Helen, Marti, and Bill continued to play horns together, along with a few other players who came and went over the years. 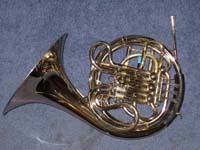 In 2001, at a point when the group was down to a trio, Helen and Marti met up with Bruce (who had gone over to the dark side and was playing trumpet almost exclusively) through their mutual involvement with the newly formed Milton Community Band, and eventually cajoled him into (re) joining the group on horn. Since then, we have continued to play together as a quartet, and kept the group going even during an extended period when Marti was temporarily living in Syracuse, NY. (Talk about a commute!) We've all got day jobs, but we try to meet once a week to play horn quartets for our own enjoyment. We occasionally play at weddings in the area, and to the best of our knowledge there have been no divorces among any of the couples we have played for over the years. While we make no guarantees, it is our belief that if you walk down the aisle to horns, It's Official.